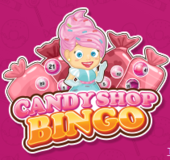 Candy Shop Bingo is a sweet bingo site that operates on the Cassava Enterprises label. The site has a tasty candy theme, lots of sweet graphics, and a very pink background. You can play 75-ball, 90-ball and jackpot Bingo games along with various slots and instant games. There are also many promotions on offer that makes Candy Shop Bingo one of the exciting new Cassava bingo sites to launch in 2015. When new players at Candy Shop Bingo login and make their first deposit, they can claim 3 exciting treats . Newbies get an immediate 300% Welcome Bonus and £10 towards Free Spins. Plus, players get 2 free Candy Coins to play in the Candy Collector Game. This exclusive game gives players a chance to get additional bonuses and prizes. Newbies also get to play in the No Lose Bingo room after they make their first deposit. The best part of No Lose Bingo is that tickets are refunded if a player doesn’t win. Besides the new player bonuses another top promo is free bingo, with 4 free bingo rooms where you can win real jackpots. Watch this space for the latest exclusive coupon codes! Candy Shop Bingo offers players a wonderful selection of the best online bingo games. Players can enjoy the collection of 90-ball bingo games and 75-ball bingo games as well as special promotional bingo games with massive jackpots. There is a monthly bingo game, The Big £10K, where players have the chance at a £10,000 jackpot on the 10th of every month. There’s also a variety of slot games to choose from including popular titles such as Cleopatra Slots, Irish Luck, Gonzo’s Quest, and Fluffy Favourites slots.